Mitsui Chemicals, Inc. (Tokyo: 4183; President & CEO: Tsutomu Tannowa) is proud to announce it has been selected as one of the Derwent Top 100 Global Innovators 2018-19 by Clarivate Analytics. 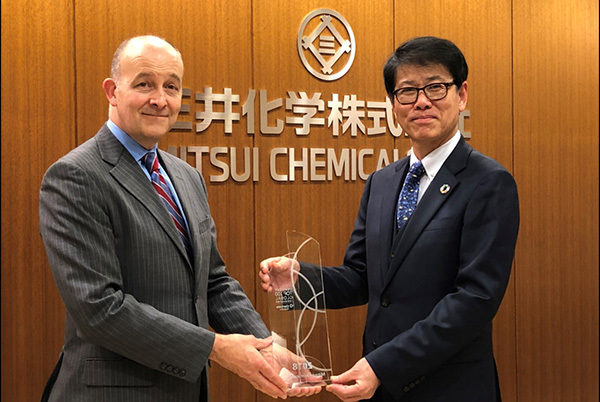 This is the third time Mitsui Chemicals has been named for this honor, following 2015 and 2017. On February 28, 2019, Clarivate Analytics visited the company headquarters to present the trophy. Clarivate Analytics selects the Top 100 Global Innovators based on its proprietary intellectual property and patent data. Using its original indices, the global information service firm identifies and recognizes the world’s most innovative organizations who successfully develop valuable patented inventions with strong commercialization potential while respecting and preserving intellectual property rights. The analysis is based on four criteria: overall patent volume, patent-grant success rates, globalization, and invention influence as evidenced by citations (evaluated over the period of five years, with the exception of global reach). Mitsui Chemicals was recognized as one of the Top 100 Global Innovators for its continued high marks in global reach. The Derwent Top 100 Global Innovators report, annually published by Clarivate Analytics, details the most innovative companies based on volume, success, globalization, and the influence of patents. The report utilizes the Clarivate Analytics’ proprietary data and analysis tools such as Derwent World Patents Index (DWPI), comprehensive value-added database of worldwide patents, and Derwent Innovation, patent search and analytics platform.